They had not the liberty of the birds of the air to build or repair their nests—they had behind them the forest or the rocky soil, which they were not allowed, without licence difficultly obtained, to reclaim and till. Their only resource was the stormy ocean, and they saw the wealth they won from the deep spent in other lands, leading them only a scanty subsistence. Despite of all this they have increased twenty-fold in ninety years, have built towns and villages, erected magnificent buildings, as the cathedral in St. John's, introduced telegraphs, steam, postal, and road communications, newspapers, everything, in fact, found in the most civilised countries, and all this on a rugged soil, in a harsh though wholesome climate, and under every species of discouragement. 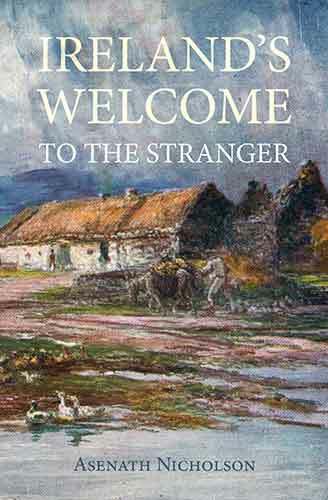 We have seen that the 'Irish Papist' could not be discouraged out of the country, in which he was not without the ministration of the priest, who, though he had no fixed abode in the island, usually came out in a fishing-boat, and so disguised as to escape the vigilance of the hostile authorities. Protestants suffered from no such disadvantage. Their's was the recognised religion of the State, and its ministers were stationed in the principal settlements. This indeed was the state of things throughout the continent of America, wherever, in fact, the British power was recognised. Catholics were under a ban, hunted, persecuted, or grievously discouraged, while Protestants enjoyed in its fulness the advantages of a protected Church and a dominant religion. This should be always taken into consideration when estimating the progress of those who were guilty, in the eyes of their jealous rulers, of the double offence of being Catholic and Irish. The Governor acquaints Mr. O'Donnell that, so far from being disposed to allow of an increase of places of religious worship for the Roman Catholics of the island, he very seriously intends, next year, to lay those established already under particular restrictions. Mr. O'Donnell must be aware that it is not the interest of Great Britain to encourage people to winter in Newfoundland, and he cannot be ignorant that many of the lower order who would now stay, would, if it were not for the convenience with which they obtain absolution here, go home for it at least once in two or three years; and the Governor has been misinformed if Mr. O'Donnell, instead of advising their return to Ireland, does not rather encourage them to winter in this country. On board the Salisbury, St. John's, Nov. 2, 1790. What a proclamation of intolerance and stupidity! We doubt if, considering the period at which the world had arrived, there was ever penned a more discreditable epistle. We shall now see how this cruel mistrust was repaid by the distinguished minister of religion who was its object. It was in the year 1799, shortly after the memorable Irish Rebellion, that the circumstance occurred which exhibited in the most conspicuous manner the value of the influence and authority of a zealous and courageous pastor, and the wisdom of encouraging, rather than discountenancing, the presence of a Catholic clergyman in the midst of an Irish population. Many who had been compelled to fly from their native land in consequence of the rising of 1798 found refuge in Newfoundland, bringing with them the exasperated feelings engendered by that disastrous conflict: nor was the state of things in the colony such as to soothe the bitter hatred which they cherished in their hearts. Amongst them a conspiracy was formed, its object being the destruction of the Protestant colonists; and such was the success with which the conspirators pushed their machinations that they secured the sympathy and promised co-operation of a large portion of the regiment then stationed in St. John's. Their plans were laid with great secrecy and skill, and the day was appointed for carrying their fatal designs into execution. The time chosen was when the people had assembled at church, and, it not being then the custom for the military to carry arms into the sacred building, it was considered by the conspirators that those who would thus go unarmed could not offer much difficulty in the execution of the fearful plot.